On Saturday, October 13, Dead Nation Presents and Top Dawg Entertainment proudly host Jay Rock’s The Big Redemption Tour at the WOW Hall with special guest Reason. Redemption is the third studio album by rapper Jay Rock; it was released by Top Dawg Entertainment and Interscope Records on June 15, 2018. It succeeds Rock's second album 90059, released three years prior. Redemption features production executive producer and Top Dawg Entertainment label-head Anthony "Top Dawg" Tiffith, Sounwave, Hit-Boy, Mike Will Made It and Boi-1da; as well as further contributions from Jake One, Teddy Walton, Cardo and Vinylz, among others. The album features TDE label-mates Kendrick Lamar and SZA, as well as appearances from Future, J. Cole and Jeremih. The album was met with critical acclaim and debuted at number 13 on the US Billboard 200. The lead single "King's Dead" --with Kendrick Lamar, Future and James Blake -- was released on January 11 and also served as a single from the Black Panther Soundtrack. Kyle Mullin from Exclaim! noted that Redemption is, "a heartening LP, both because of the top-notch, life-affirming beats throughout, along with the renewed vigor in the voice of a man who clearly takes nothing for granted now that he's on the mend. Top Dawg Entertainment added to its rich roster of talent with the signing of Reason, a Del Amo, Calif.-bred rapper who gained his most significant bit of exposure when he appeared on the label's Black Panther soundtrack earlier this year on a song called "Seasons”. While Reason isn't a nationally known name, he's a rhymer who's definitely got the skills to become one. "The Soul" serves as a showcase for some serious talent. On the track, Reason delivers some passionate bars about his come-up. It's basically a classic "I've finally made it" kind of vibe, and it's dope. Up to this point, the Black Panther soundtrack and Reason's own There You Have It project have been his biggest drops to date. Now, he should be doing it bigger than ever. Tickets are $20 in advance, $25 day of show and $75 for Meet & Greet. Doors open at 8:00 pm and showtime is 9:00. 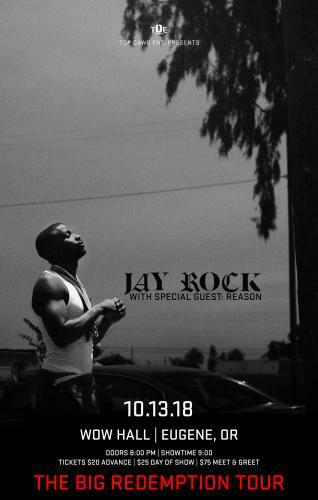 On Saturday, October 13, Dead Nation Presents and Top Dawg Entertainment present Jay Rock "The Big Redemption Tour" at the WOW Hall with special guest Reason. Customers can contact INFO@FUTURE-BEAT.COM <mailto:INFO@FUTURE-BEAT.COM> with any questions concerning their package.